Upcoming: Friday, March 15, 2019, 5 to 8 PM. Two category 5 hurricanes in 2017 wrought havoc to our precious island, St. John, US Virgin Islands. My SUBJECTS had necessarily changed, in either substance and/or spirit, subjects that I painted or related to in one way or another. I observed instead fractured aggregates that took on identities and forces of their own - their SHAPES of color, texture, value and personality, over time recomposing and reforming into different, perhaps unique, entities. Evident in landscapes, seascapes, structures, “things”, people, relationships and communities, the transitions moved/move at various speeds, from explosive to crawling, and perhaps still dragging. The practical act of creativity involved in this re-envisioning of bits and pieces, of our essence, is transformative. We will be raffling this painting by Kimberly and this print on aluminum by Caroline Rogers, with 100% of the proceeds going to the St. John School of the Arts. Tickets are $10 each or 6 for $50 and can be obtained at the gallery or by calling the School at 340-779-4332 or at the event. You do not have to be present to win. Friday, January 25, 2019, 5 to 8 PM. As unimaginable as it may be, from the insanity of “Irmaria” may emerge...SERENITY. Celebrating five years at the Marketplace, this Event will focus on visions of the future of St. John, specifically Environmental Regeneration: Through Building Resilience. 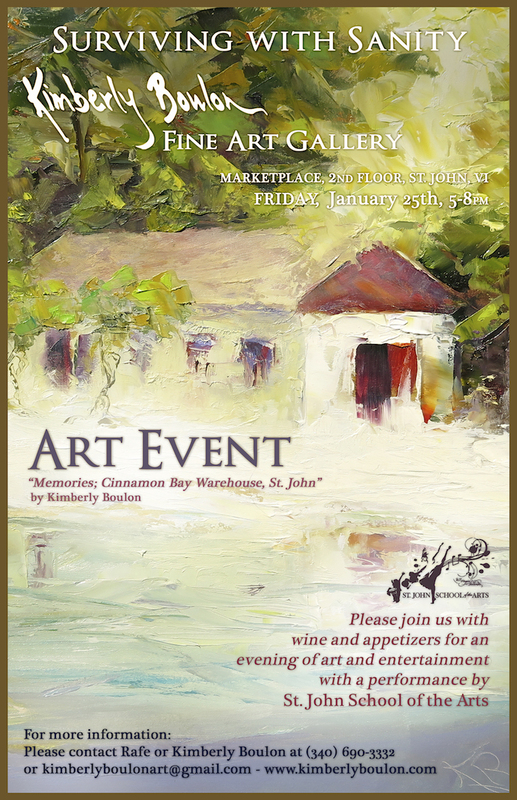 An original 12"x16" painting of Cinnamon Bay will be raffled to support the St. John School of the Arts at the Event (see below). This 12"x16" oil painting, entitled "Cinnamon Bay Forever", valued at $1850, will be raffled off at the end of the Event on Friday, March 17 from 5 to 8 PM. 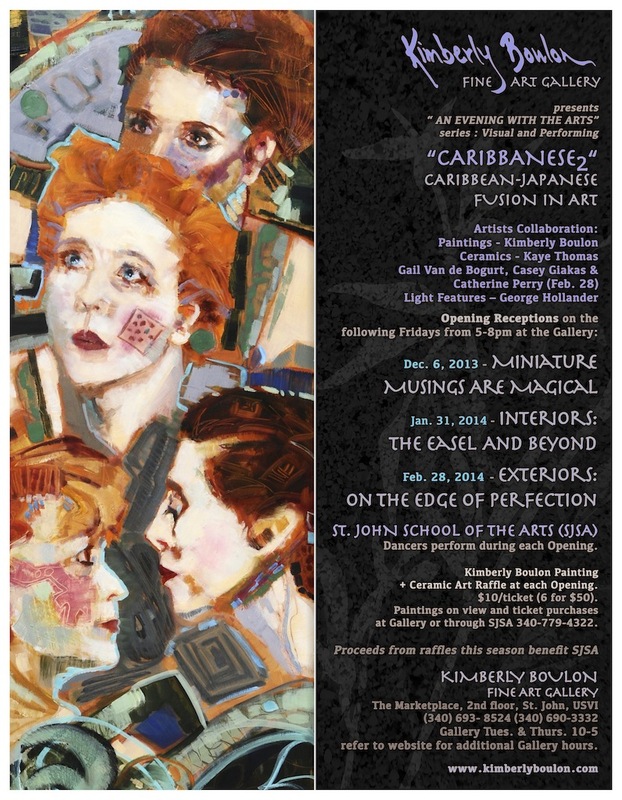 100% of the proceeds benefit the St. John School of the Arts. 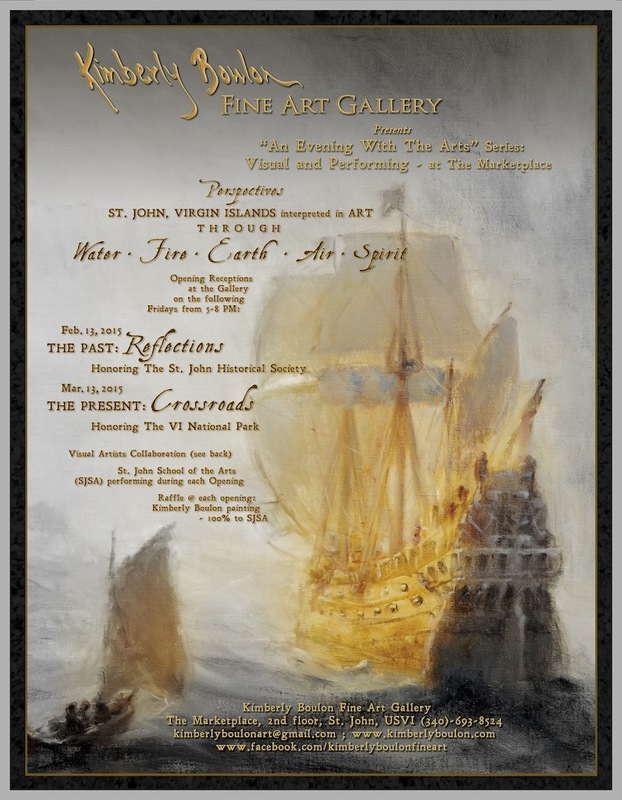 Tickets are $10 each or six for $50 and can be purchased at the gallery, at the SJSA (340-779-4322) or at the Event. The painting can be viewed at the gallery. You do not have to be present to win. 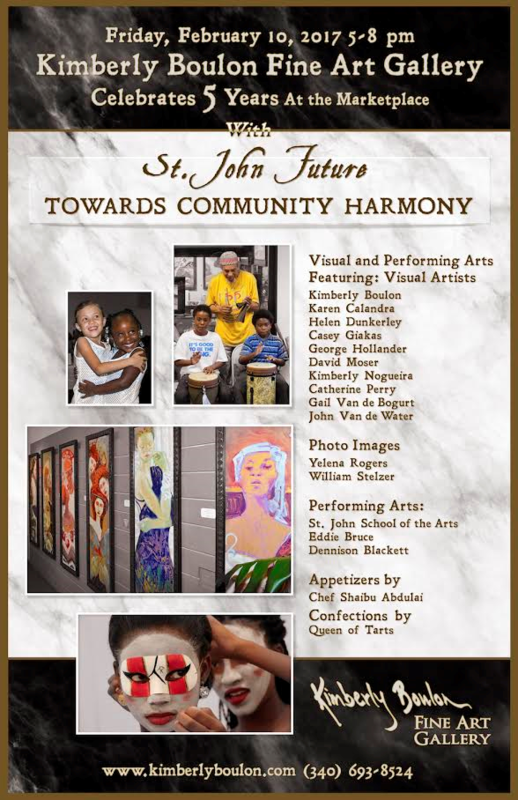 Celebrating five years at the Marketplace, this show will focus on visions of the future of St. John, specifically community harmony. The next show in March will focus on environmental regeneration. 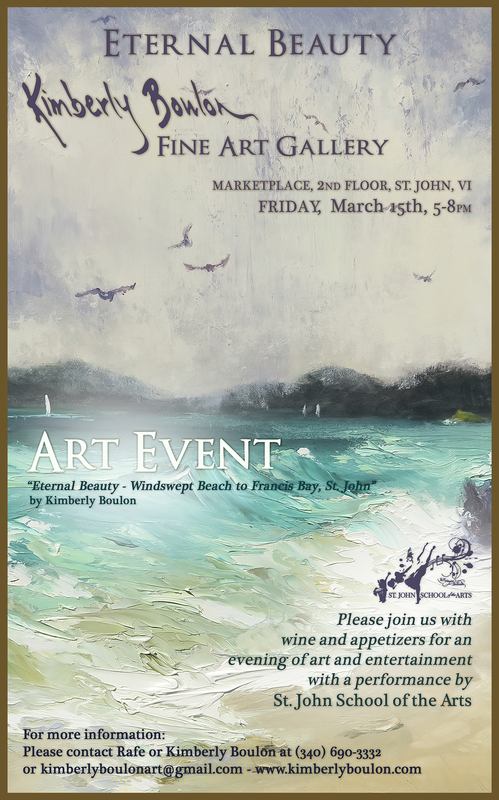 An original 12"x16" painting of Trunk Bay will be raffled to support the St. John School of the Arts at the February show (see below). This 12"x16" oil painting, entitled "Fry In July, Trunk Bay, St. John", valued at $1850, will be raffled off at the end of the show on Friday, February 10 from 5 to 8 PM. 100% of the proceeds benefit the St. John School of the Arts. 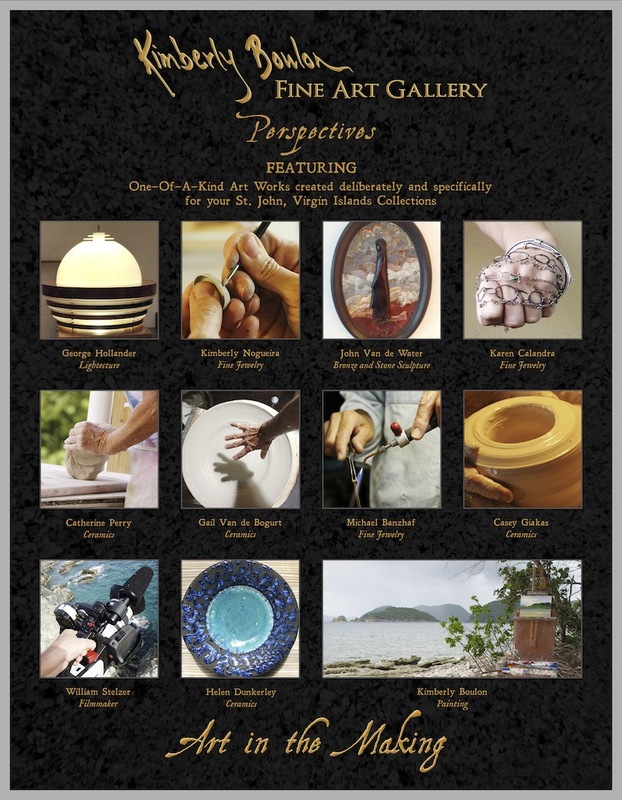 Tickets are $10 each or six for $50 and can be purchased at the gallery, at the SJSA (340-779-4322) or at the show. The painting can be viewed at the gallery. You do not have to be present to win. 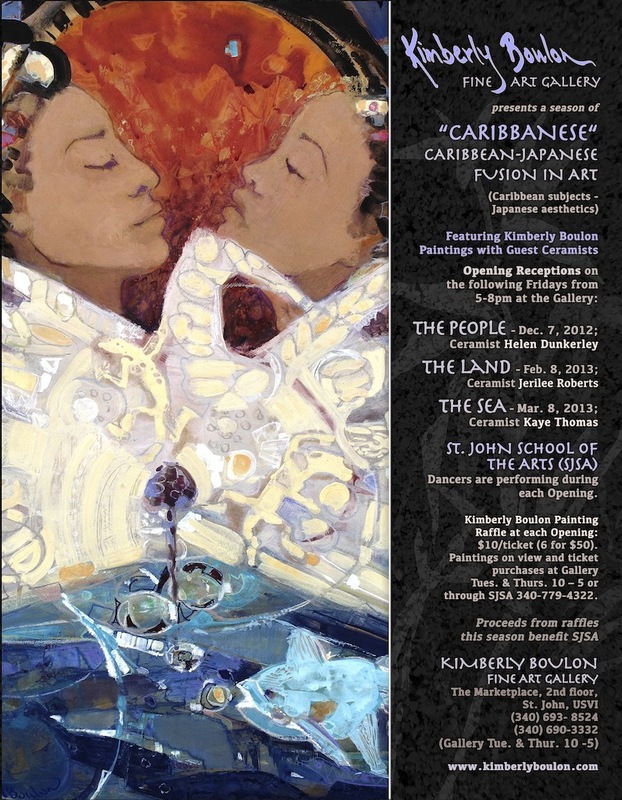 A show of Kimberly's artwork entitled "St. John Sublime" commemorating the 100th anniversary of the National Park Service and the 60th anniversary of Virgin Islands National Park. Please join us in the Gallery for our pre-Valentine One Man Show as we present GEORGE HOLLANDER’S newest light objects. 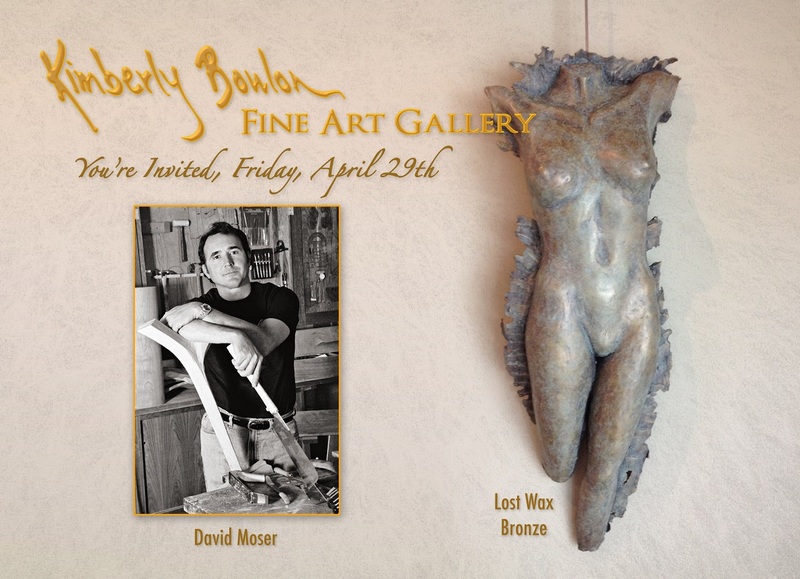 For one night only, the Gallery will extinguish it's own lights for this event. 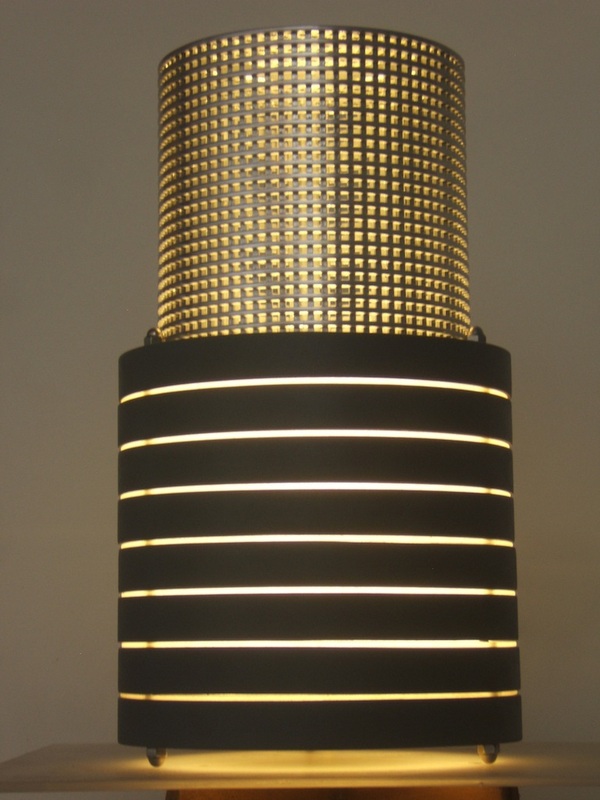 "LIGHTECTURE" will take place on Friday, February 12th from 5 to 8pm, on the 2nd floor of the Market Place, St. John. The focus of Mr. Hollander's presentation is the architecture of light, hence the word "Lightecture"... Light plus Architecture. 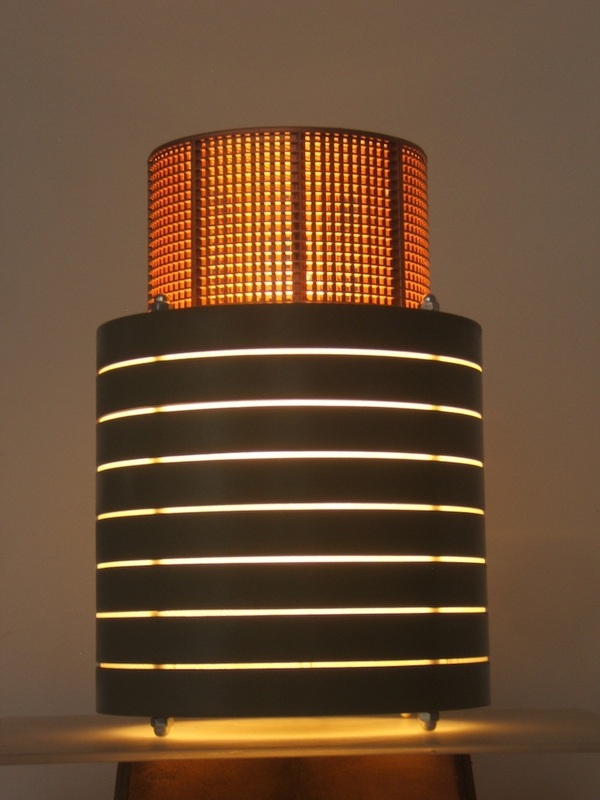 His work breaks from the traditional forms of lighting, towards an exploration of new ideas in form and function. The "functional art" movement of the late 70's, early 1980's caught his attention while working in New York City and has been a part of him ever since. His current work reflects an organic evolution, a boldness in its authenticity and originality, that needs to be experienced. For those who attend his opening at the Gallery on Friday, February 12th, George will unveil two new spectacular pieces (not the two below). 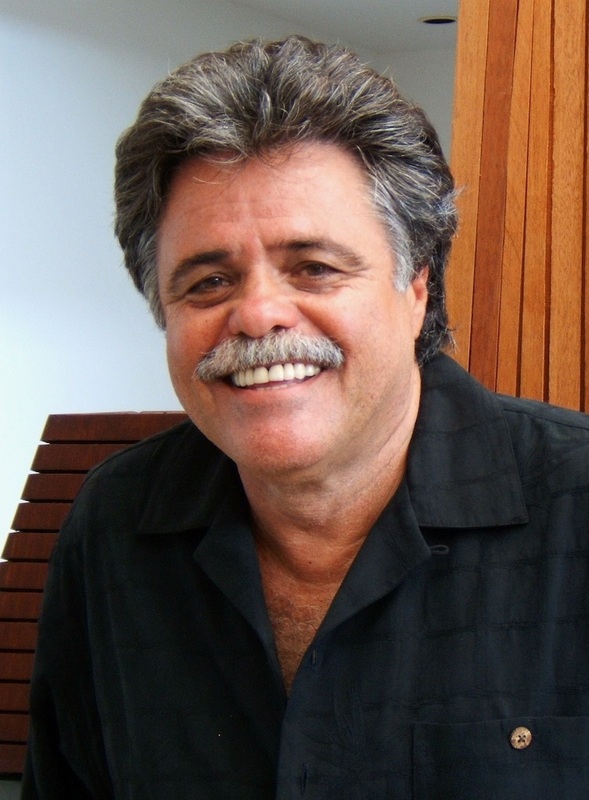 Go to the Gallery Guest Artist page for more works by George and his Bio. 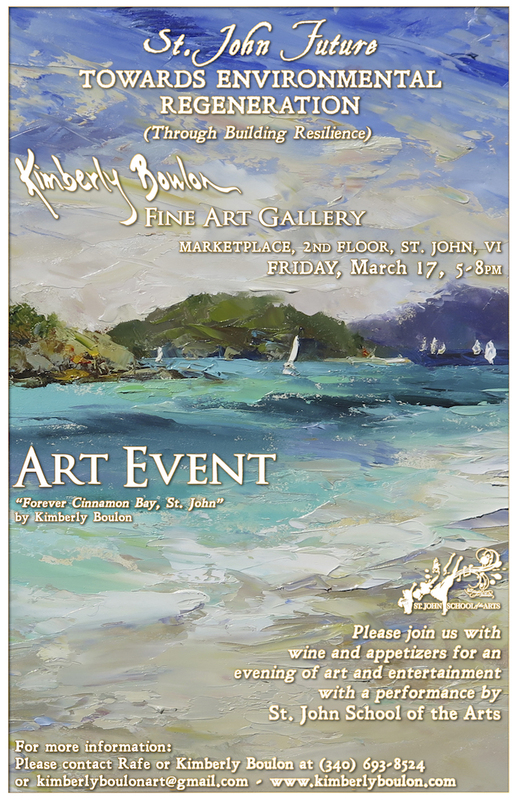 Please consider taking A CHANCE TO WIN Kimberly's paintings and support the St. John School of the Arts (SJSA). 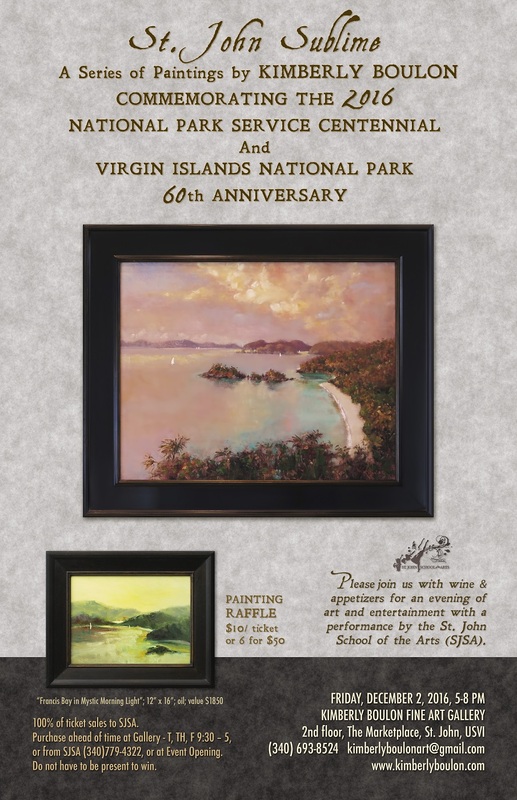 "Tortola Sloop And Whistling Cay Guardhouse: Sailing To Freedom" (#310) will be raffled off Feb. 13 at our Gallery "An Evening With The Arts" Event. "Trunk Bay Cay To Denis Bay And The Durloes In Perpetuity" (#311) will be raffled off March 13 at our next Gallery Event. They are both 12 x 16 in., oil, and include a lovely black frame and are valued at $1850 each. 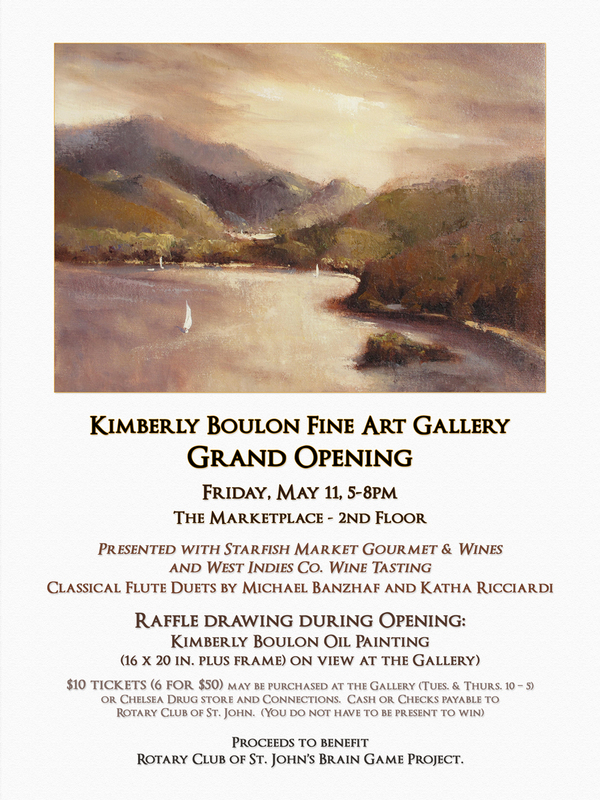 The paintings are displayed in the windows of Kimberly Boulon Fine Art Gallery at the Marketplace. Tickets are $10 ea. or 6 for $50. 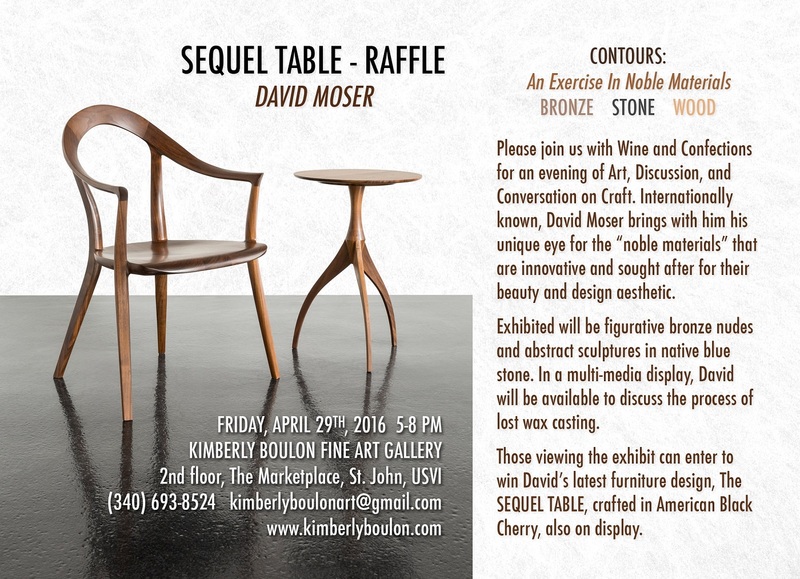 You may mix tickets for both paintings. 100% of the sales goes to SJSA and are tax deductible. Shipping is not included but we ship anywhere. You may purchase tickets at the Gallery on Tuesdays and Thursdays 10-5pm and from SJSA 340-779-4322, or the evening of the Events. You do not have to be present to win but we'd love to have you there. Thank you for your support of our precious Art School! Slowly running my eyes up old historic St. John stone and brick walls, ruin after ruin, sensing the crumbly texture of ocean-voyage brick, juxtaposed to earth-loosened stones and ripped-from- the-reef corals, time stood still – standing like a lonesome ghost of a tragic past. How I wanted to feel the pain but know I am not of that world, of that character, of that passion. Every single abstract shape, every color, every line in those walls had a story to tell, and I wanted to hear it. I am listening more than ever, deeper than ever. This is an on-going challenge and I move forward with excitement yet trepidation as I am committed to finding within me a place to go with a quiet, knowing mind and a telling brush. This is my journey- how will these walls speak to me? The little fern sprouting from a crack gives life to the process. I was sailing at Foxy’s Wooden Boat Race, at Jost Van Dyke, let’s say back in the day, on a fine wooden boat, but it wasn’t the boat my eyes followed, tacking and jibing and swooshing in the most sensual way. It was a small island sloop, and in my mind it had a never-ending boom where the sail ran to catch a hold, billowing and billowing. A romance was started. Island sloops - too beautiful to get over, yet too time-laden and life-burdened to live big in numbers when engines get you somewhere fast. Still, I have a dream, that it is the island sloop that I will journey in on canvas and the sea…. What? A pirate encounter at Carval rock? Galleon gold. It could have been. 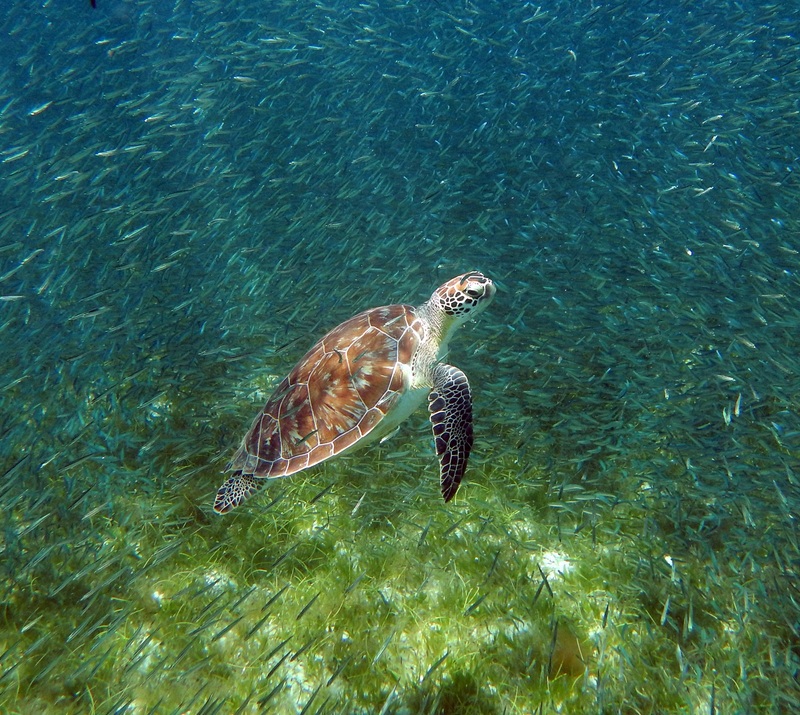 These waters have their secrets. Why not imagine them? The sky has the brilliant light, the water has its depths, it’s lost anchors and forgotten history, and I have the brush. Paint boldly, paint passionately, paint into the future from out of the past. See Kimberly's show paintings in the Portfolio of Paintings (2015 Show) and guest artist pieces on the Gallery Guest Artists page.